A day without glass is a day without sunshine. And as long as I am doing glass, I am happy. 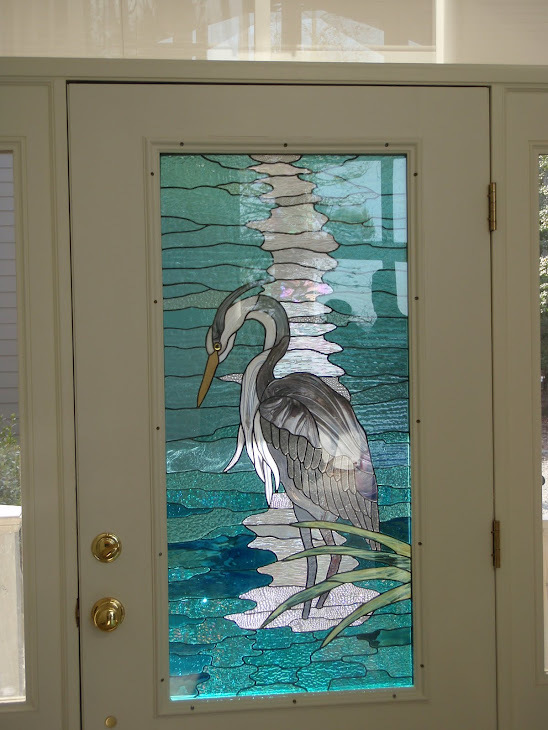 My primary livelihood is teaching stained glass, and I offer accommodations here in my home/studio for out of towners to stay here and attend a two day class, completing a beautiful original panel while learning all the necessary techniques. it's a blast, both for me and my guests. I have made so many new friends through my business. And now I hope to meet even more through this blog. Patty and Angie have been friends forever, and their panels illustrate that though their styles are way different, they are both talented and creative. we had fun creating Angie's mermaid, and Patty's five-pointed star challenged my geometry skills! I can't wait to see what they do next time!! my favorite mermaid - 5' high! Stained glass is my passion. I love the colors and textures and the way that light works to create a constantly changing work of art. 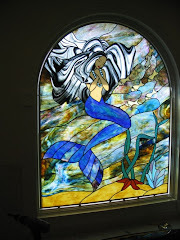 I do residential, religious and commercial commissions, and I teach classes. With this blog I want to be able to share my experience and knowledge with more glass enthusiasts. and she's coming back for more!